Newly decorated three bedroom, two-bathroom home. Steps from Tampa Bay with its quiet beach featuring dolphins, warm water and the famous Rod and Reel where you’ll hang with the locals and eat delicious seafood. It’s also a short ten-minute walk to Bean Point where you’ll catch the sunset over the Gulf of Mexico. During the day you’ll experience all that Anna Maria has to offer as you cool off in Tampa Bay or Gulf of Mexico, walk for miles on the sandy shore or take your pick from several excellent beach side establishments. Around the corner you can rent bikes, kayaks and more to see the island from a different perspective. There is also a free trolley service which takes you anywhere on the island! The sunny master bedroom has a king bed and flat screen TV; guest room has a queen bed; and upstairs loft has two single beds plus a double futon with TV/VCR, video library and games. Perfect for children! There is a three-piece bathroom on each floor. Can comfortably accommodate up to a maximum of 6 adults (minimum age - 25 years) or four adults and up to two children. IMPORTANT NOTE: We normally schedule our rentals to begin and end on Saturday. However, during the fall season, we are flexible. Please send us a direct inquiry rather than booking online. This way we can work out details that will fit your request. Thank you! A few games are available in the loft area. Private pool in the back yard - heated in the winter. Solar blanket available. renter can put on & remove. We are not responsible for injury caused by use of pool or solar blanket. My family loved this house. 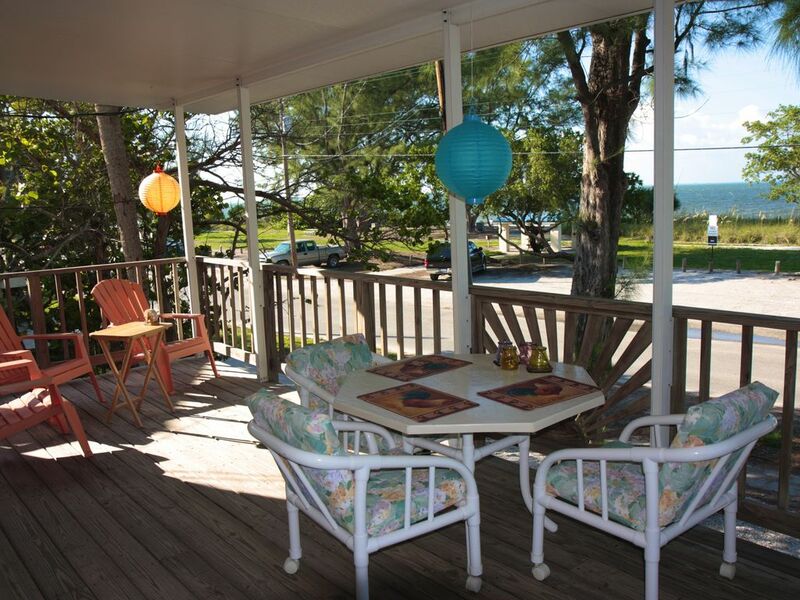 It is located in a quiet area of AMI with a great view of the bay. We loved sitting out on the covered deck in the morning and evening looking at the bay. The private pool was also great during the day. We spent our time going from the pool to the beach! The house was clean and spacious. Comfortable beds. Lots of towels and beach toys. I would just recommend that more dish soap and laundry soap be left so that we could keep on top of the cleaning while we are there (we loved to bbq instead of eating out). This cute house is located in between city pier and rod and reel. The pool and tropical backyard are by far the best part! I would book this house again in a heart beat. Great front porch view of the ocean. Paradise.... Beautiful view. Loved the heated pool! This home was perfect for our island get away. Plenty of room for our family of 4. Short walk to the beach with an amazing view of the bay. We love AMI and plan to return soon. Thank you Barb and Karel! Well maintained, clean and perfectly located within walking distance of so many places. It was a great getaway and we loved it...and AMI as well! House is well apportioned and family friendly. Located directly across from a smaller public beach on the bayside (nearly private) and very short drive from great beaches on the gulf side. We will come back! Hi Daniel - thank you for your review. We strive to make sure the house has everything a family will need for an enjoyable stay - pool/beach toys, movies and games. We love the Tampa Bay beach - and also walk to Bean Point on a regular basis - one of the prettiest points on the island to see their show stopping sunsets. Best wishes and we look forward to your return.